Mass spectrometry (MS) plays an increasingly important role in biomedical research as an extremely powerful technique used to characterize proteins and protein post-translational modifications (PTMs), measure corresponding abundance changes and investigate protein interactions. Our research interests are primarily directed towards developing novel MS-based proteomics methods and applying them to the biomedical studies. LC-MS-based method development to study protein PTMs. Protein PTMs have a profound impact on protein structure, function and stability. Effective separation and enrichment methods are crucial for studying the modified forms of proteins present in cells or tissues. Due to the structural differences between the more than 200 PTMs reported, there is no common method suitable for analyzing numerous PTMs. Distinctive structures and properties of each group allow us to design specific methods to study individual protein modifications, which will be applied to biomedical research. Protein function, cell signaling and cancer. Cells respond to a plethora of intra- and extra-cellular signals. Ineffective or improper signal transductions, which are often carried out by protein modifications, may lead to human diseases such as cancer. Proteins and their PTM changes at different cellular states may be comprehensively analyzed by quantitative MS-based proteomics methods, which can improve our understanding of protein function, cell signaling pathways, and molecular implications of drug treatment. Thus, it will be possible to discover novel disease biomarkers, identify new drug targets and contribute to the selection of better targeted agents on an individual basis, which will result in potential applications in personalized medicine. Cell metabolism. Cell metabolism is directly related to many diseases, including cancer cells which have notably abnormal metabolism. 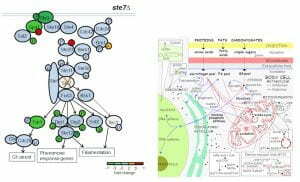 The metabolism network is very intricate and complicated; hence investigation at the whole proteome level may provide new insight. Furthermore, the changes in metabolites and interactions between enzymes and metabolites may also be monitored by MS. Our research attempts to understand how proteins regulate the generation of metabolites, and how metabolites affect metabolic pathways. We are striving to unveil new regulatory mechanisms of cell metabolism, and to advance our knowledge of abnormal metabolism of cancer cells. A further understanding of the mechanistic links between cellular metabolism and signal pathways may ultimately lead to new drug discovery and benefits for human health.